I’m listening to the latest episode of the Fitcast right now…and one of the best parts was the very first segment. Host Kevin Larrabee was having a short discussion with the host of another hot fitness podcast, Anthony Renna of the Strength Coach Podcast. This caught my attention simply because traditional business culture would suggest that since they are competing podcasts, why would they share their ideas, etc with eachother. To hear them discuss whats going on with eachother’s podcasts was a great example of a mastermind (something I learned about from reading Think and Grow Rich). It was great to hear them discuss these things and implicitly push the message of collaborating in this industry instead of competing in the traditional dog-eat-dog culture. What I really enjoy about both podcasts is that they have unique segments to their respective podcasts, plus they offer a more personal medium through which to hear some of the fitness industry’s heavyweights (compared to reading an article). Lastly, listening to these podcasts always gets me motivated to network as these two have become very good at that, and shown that it is possible to contact these experts in the field. Everyone who takes a post-workout shake or knows they should understands that the reason is to replace nutrients that were lost during exercise as quickly as possible. Specifically, the idea of taking a fast-digesting carbohydrate (think simple sugars) post-workout when insulin is spiked to start replenishing muscle glycogen stores. These simple sugars are usually either dextrose or maltodextrin. Here’s where the catch 22 comes in: These sugars are taken into the body with the intention of replenishing muscle glycogen, and since these are classified as fast-digesting (or high Glycemic Index) carbs, they should be absorbed more quickly into the bloodstream and then into the muscles than if taking a slower-digesting carb. What if this doesn’t occur as well as initially thought?? What appears to happen because of the chemical properties of these forms of glucose is that absorption into the bloodstream is slowed down. The osmolality of the solute (dextrose or malto.) is similar to that of the blood (when the osmolality of the solute matches that of the solvent, an isotonic environment results and no fluid displacement occurs). So a near isotonic solution is achieved between the dextrose/malto. and the blood. What ends up happening then is the carb “trickles” into the bloodstream from the stomach, which obviously will limit how quickly the nutrient arrives at the muscle to replenish the glycogen. Side note: All the dextrose/malto. pooling in the stomach is what is happening when you get that bloated feeling after downing a shake. After knowing this, we must wonder is there a better way?? Is there actually a true fast digesting, fast metabolizing carb for our post-workout shakes?? Here we have a fast digesting carb that passes through the stomach very quickly! (All due to its uniquely low osmolality) So when it gets to the stomach it does not pool there and trickle into the bloodstream; it gushes into the bloodstream! 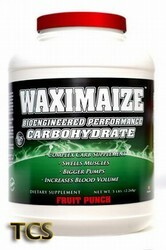 This allows it and any other nutrients in the post-workout shake to be delivered to the muscles very quickly. But what about dextrose, does this mean its worthless to include in post-workout shakes?? I would argue, no. First, dextrose is far more easily available than Waxy Maize so if you can’t find waxy maize at a supplement store near you or you don’t want to pay shipping from an online supplement dealer, dextrose is better than nothing. Also what I want to know is even though dextrose doesn’t “gush” into the bloodstream when its digested, does it still enter the blood quickly enough to take advantage of the post-workout insulin spike?? If it does, are we really missing any benefit when taking it?? This is simply a summary and commentary on what I’ve read and reviewed lately about post-workout nutrition. As such, it piqued is a topic that piqued my interest and is something I want to try out to experience if there is a noticeable difference and true benefit to waxy maize. After my informal personal experiment, I will be sure to post a follow-up of what I found. I was sitting in on a nutrition assessment with several of the hockey players who are training with us during the off-season, and I just sat, listened, and jotted notes down. The vast majority of the information given to the hockey players was NOT advanced stuff only known by those performing the latest nutritional lab research. It was in fact, incredibly basic! However, basic was all these athletes needed! Not that this wasn’t expected, but I had forgotten how basic it really was. And I think this uber-basic approach works wonders for so many people looking to improve their body composition or gain size, but often the basics are skipped in search of either more advanced information (because advanced means better, right?) or for some quick fix solution. Needless to say, sitting in on the session will also be beneficial to me personally, as I know I have overlooked some of these simple things in my nutritional adventure. This review couldn’t have come at a better time for me, because I really feel that I needed to hear this stuff again! Such a large part of training and coaching is the ability to communicate with clients well! Unfortunately, there’s no one size fits all communication style that will work with every person. Different clients have different learning styles so what I’ve been learning to do is present instruction and feedback in various ways to accomodate this. Yesterday I was working with an athlete who’s been training with SST for over a year, and for a while now his program has included a steady dose of deadlifts. There’s just been one issue: his deadlifting form is not the greatest, and it seems that bad habits have been developed due to repetition of improper form. Because of this, fixing the problem has not been a quick process. And I’ve spent time DISCUSSING with this athlete the changes I would like to see in his form, I’ve spent time SHOWING this athlete what the changes should look like in comparision to what he is doing…and other coaches have been doing the same. To show for all this effort on everyone’s part, only minimal improvements have been made. So yesterday I decided to try a different method: record his sets on a digital camera and let him watch it afterwards while discussing what HE sees. After the first set, he watched the clip and he realized what us coaches have been telling him for some time now, and the funny thing was all this time, he FELT as though he was making the correct changes! From the clip he saw that this wasn’t the case. Now we didn’t fix the problem on the very next set, but now that he sees the changes he still needs to make, he is getting closer to the right track. In summarizing, I have noticed as I’ve been improving my ability to communicate with the clients at SST, that the ability to effectively reach people with different learning styles has been both a challenge but also something that has gotten easier the more that I recognize and adapt to these situations. And I am always surprised at how much the clients continually teach me, when superficially the flow of information would appear very one-sided (me to them). Its interesting how an article was published at T-Nation yesterday on this very concept because in talking to another trainer while at work yesterday, I realized perhaps I was guilty of doing the same. We were talking about seated overhead pressing with or without the use of a back support (bench set to 90 degrees). Now my 100% rule had been that if the client can stabilize their upper body while pressing a load overhead, no back support should be used (notice the black-and-white nature of the statement). However what I was made to realize is that for stronger clients a seat back might be an option to allow for enough overload without compromising spine health. Now I guess an argument could be made that if the client has learned how to properly stabilize their lumbar spine under load, then they should not have a problem stabilizing under a heavy weight. Or that if they can’t stabilize with a certain weight, they shouldn’t be lifting it. But I have to remember that different people train for different goals. If someone wants to get add muscle mass without worrying about transfer to performance does it really matter that they are not performing an exercise standing, or with a back support, etc?? My clients will be happiest if I help them achieve THEIR goals. This conversation was a very good (and apparently much needed) reminder of what a part of my job entails! On the weekend I saw a women’s health magazine (NOT Women’s Health) and one of the headlines on the cover was “get a 30 minute workout in during your lunch” (not an exact quote), and this piqued my interest…”hmmm, what are they going to suggest?” I thought, so I opened the magazine up to the article. It was essentially a 2 page spread giving a visual of the exercises and a small blurb about the muscles they worked and recommended weights. Now the exercises that were recommended were pretty good (hip extensions and pushups were both included), however the loading recommendations were what caught my attention. What if the recommended reps (15-20 in this case) can be performed with a heavier weight? Is being able to use 20 pound dumbbells going to make this exercise all of a sudden bad? Or will using heavier weight result in the woman no longer being feminine? Again, I’m not bashing the article because if it gets women active and lifting weights that is the ultimate goal, but imposing limits in the recommendations is not something I agree with at all! Yesterday was a great day for the 4th annual SST charity road hockey tournament! This is the second year I’ve been involved in the event, and this year I got my own team (all trainers were team captains). Naturally every team wants to win, however the real purpose of the day is to raise money for a charity. This year’s charity was Transitions for Youth, (you can click the link to find out more). Some great hockey was played and everybody had a lot of fun! I can’t wait until next year’s tournament!